In contrast to a turbojet, the engine's exhaust gases do not generally contain enough energy to create significant thrust, since almost all of the engine's power is used to drive the propeller. Exhaust thrust in a turboprop is sacrificed in favour of shaft power, which is obtained by extracting additional power (up to that necessary to drive the compressor) from turbine expansion. Owing to the additional expansion in the turbine system, the residual energy in the exhaust jet is low. Consequently, the exhaust jet typically produces around or less than 10% of the total thrust. A higher proportion of the thrust comes from the propeller at low speeds and less at higher speeds. The propeller is coupled to the turbine through a reduction gear that converts the high RPM/low torque output to low RPM/high torque. The propeller itself is normally a constant speed (variable pitch) type similar to that used with larger reciprocating aircraft engines. Propellers lose efficiency as aircraft speed increases, so turboprops are normally not used on high-speed aircraft above Mach 0.6-0.7. However, propfan engines, which are very similar to turboprop engines, can cruise at flight speeds approaching Mach 0.75. To increase propeller efficiency, a mechanism can be used to alter their pitch relative to the airspeed. 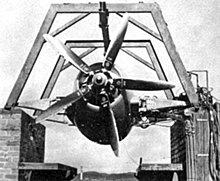 A variable-pitch propeller, also called a controllable-pitch propeller, can also be used to generate negative thrust while decelerating on the runway. Additionally, in the event of an engine failure, the pitch can be adjusted to a vaning pitch (called feathering), thus minimizing the drag of the non-functioning propeller. The world's first turboprop was designed by the Hungarian mechanical engineer György Jendrassik. Jendrassik published a turboprop idea in 1928, and on 12 March 1929 he patented his invention. In 1938, he built a small-scale (100 Hp; 74.6 kW) experimental gas turbine. The larger Jendrassik Cs-1, with a predicted output of 1,000 bhp, was produced and tested at the Ganz Works in Budapest between 1937 and 1941. It was of axial-flow design with 15 compressor and 7 turbine stages, annular combustion chamber and many other modern features. First run in 1940, combustion problems limited its output to 400 bhp. In 1941,the engine was abandoned due to war, and the factory was turned over to conventional engine production. The world's first turboprop engine that went into mass production[specify] was designed by a German engineer, Max Adolf Mueller, in 1942. The first mention of turboprop engines in the general public press was in the February 1944 issue of the British aviation publication Flight, which included a detailed cutaway drawing of what a possible future turboprop engine could look like. The drawing was very close to what the future Rolls-Royce Trent would look like. The first British turboprop engine was the Rolls-Royce RB.50 Trent, a converted Derwent II fitted with reduction gear and a Rotol 7 ft 11 in (2.41 m) five-bladed propeller. Two Trents were fitted to Gloster Meteor EE227 — the sole "Trent-Meteor" — which thus became the world's first turboprop-powered aircraft, albeit a test-bed not intended for production. It first flew on 20 September 1945. From their experience with the Trent, Rolls-Royce developed the Rolls-Royce Clyde, the first turboprop engine to be fully type certificated for military and civil use, and the Dart, which became one of the most reliable turboprop engines ever built. Dart production continued for more than fifty years. The Dart-powered Vickers Viscount was the first turboprop aircraft of any kind to go into production and sold in large numbers. It was also the first four-engined turboprop. Its first flight was on 16 July 1948. The world's first single engined turboprop aircraft was the Armstrong Siddeley Mamba-powered Boulton Paul Balliol, which first flew on 24 March 1948. 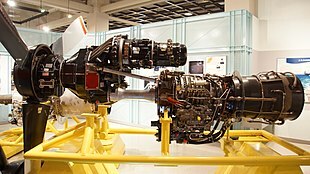 The first American turboprop engine was the General Electric XT31, first used in the experimental Consolidated Vultee XP-81. The XP-81 first flew in December 1945, the first aircraft to use a combination of turboprop and turbojet power. The technology of the Allison's earlier T38 design evolved into the Allison T56, with quartets of the T56s being used to power the Lockheed Electra airliner, its military maritime patrol derivative the P-3 Orion, and the widely produced C-130 Hercules military transport aircraft. One of the most produced turboprop engines used in civil aviation is the Pratt & Whitney Canada PT6 engine. Compared to turbofans, turboprops are most efficient at flight speeds below 725 km/h (450 mph; 390 knots) because the jet velocity of the propeller (and exhaust) is relatively low. Modern turboprop airliners operate at nearly the same speed as small regional jet airliners but burn two-thirds of the fuel per passenger. However, compared to a turbojet (which can fly at high altitude for enhanced speed and fuel efficiency) a propeller aircraft has a lower ceiling. 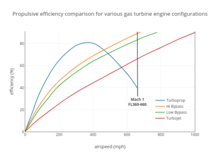 The most common application of turboprop engines in civilian aviation is in small commuter aircraft, where their greater power and reliability offsets their higher initial cost and fuel consumption. Turboprop-powered aircraft have become popular for bush airplanes such as the Cessna Caravan and Quest Kodiak as jet fuel is easier to obtain in remote areas than avgas. 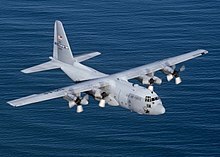 Due to the high price of turboprop engines, they are mostly used where high-performance short-takeoff and landing (STOL) capability and efficiency at modest flight speeds are required. Turboprop engines are generally used on small subsonic aircraft, but the Tupolev Tu-114 can reach 470 kt (870 km/h, 541 mph). 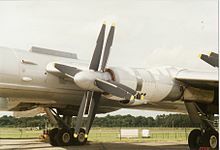 Large military and civil aircraft, such as the Lockheed L-188 Electra and the Tupolev Tu-95, have also used turboprop power. The Airbus A400M is powered by four Europrop TP400 engines, which are the second most powerful turboprop engines ever produced, after the eleven megawatt-output Kuznetsov NK-12. In 2017, The most widespread turboprop airliners in service were the ATR 42/72 (950 aircraft), Bombardier Q400 (506) and Dash 8-100/200/300 (374), Beechcraft 1900 (328), de Havilland Canada DHC-6 Twin Otter (270), Saab 340 (225). Less widespread and older airliners include the BAe Jetstream 31, Embraer EMB 120 Brasilia, Fairchild Swearingen Metroliner, Dornier 328, Saab 2000, Xian MA60, MA600 and MA700, Fokker 27 and 50. Turboprop business aircraft include the Piper Meridian, Socata TBM, Pilatus PC-12, Piaggio P.180 Avanti, Beechcraft King Air and Super King Air. In April 2017, there were 14,311 business turboprops in the worldwide fleet. Between 2012 and 2016, the ATSB observed 417 events with turboprop aircraft, 83 per year, over 1.4 million flight hours: 2.2 per 10,000 hours. Three were “high risk” involving engine malfunction and unplanned landing in single‑engine Cessna 208 Caravans, four “medium risk” and 96% “low risk”. Two occurrences resulted in minor injuries due to engine malfunction and terrain collision in agricultural aircraft and five accidents involved aerial work: four in agriculture and one in an air ambulance. Jane's All the World's Aircraft. 2005–2006. ^ "Turboprop", Pilot's Handbook of Aeronautical Knowledge, Federal Aviation Administration, 2009. ^ a b "Variations of Jet Engines". smu.edu. Retrieved 31 August 2016. ^ a b ""The turbofan engine Archived 18 April 2015 at the Wayback Machine", page 7. SRM Institute of Science and Technology, Department of aerospace engineering. ^ J. Russell (2 August 1996). Performance and Stability of Aircraft. Butterworth-Heinemann. p. 16. ISBN 0080538649. ^ a b Nag, P.K. "Basic And Applied Thermodynamics Archived 19 April 2015 at the Wayback Machine" p550. Published by Tata McGraw-Hill Education. Quote: "If the cowl is removed from the fan the result is a turboprop engine. Turbofan and turboprop engines differ mainly in their bypass ratio: 5 or 6 for turbofans and as high as 100 for turboprop." ^ Philip Walsh, Paul Fletcher. "Gas Turbine Performance", page 36. John Wiley & Sons, 15 April 2008. Quote: "It has better fuel consumption than a turbojet or turbofan, due to a high propulsive efficiency.., achieving thrust by a high mass flow of air from the propeller at low jet velocity. Above 0.6 Mach number the turboprop in turn becomes uncompetitive, due mainly to higher weight and frontal area." ^ Paul Bevilaqua. The shaft driven Lift Fan propulsion system for the Joint Strike Fighter page 3. Presented 1 May 1997. DTIC.MIL Word document, 5.5 MB. Accessed: 25 February 2012. ^ "An Engine Ahead of Its Time". PT6 Nation. Pratt & Whitney Canada. ^ "Magyar feltalálók és találmányok - JENDRASSIK GYÖRGY (1898 - 1954)". SZTNH. Retrieved 31 May 2012. ^ "Our Contribution - How Flight Introduced and Made Familiar With Gas Turbines and Jet Propulsion" Flight, 11 May 1951, p. 569. ^ "rolls-royce trent - armstrong siddeley - 1950 - 2035 - Flight Archive". flightglobal.com. Retrieved 31 August 2016. ^ "Smithsonian National Air and Space Museum - Collections - Kaman K-225 (Long Description)". National Air and Space Museum. Retrieved 4 April 2013. ^ "More turboprops coming to the market - maybe - CAPA - Centre for Aviation". centreforaviation.com. Retrieved 31 August 2016. ^ "Beechcraft King Air 350i rolls out improved situational awareness, navigation" (Press release). Textron Aviation. 30 May 2018. ^ "787 stars in annual airliner census". FlightGlobal. 14 August 2017. ^ "Business Aviation Market Update Report" (PDF). AMSTAT, Inc. April 2017. ^ Gordon Gilbert (25 June 2018). "ATSB Study Finds Turboprop Engines Safe, Reliable". ^ "The H-Series Engine | Engines | B&GA | GE Aviation". www.geaviation.com. Retrieved 1 June 2016. ^ , PragueBest s.r.o. "History | GE Aviation". www.geaviation.cz. Retrieved 1 June 2016. Van Sickle, Neil D.; et al. (1999). "Turboprop Engines". Van Sickle's modern airmanship. McGraw-Hill Professional. p. 205. ISBN 978-0-07-069633-4.